3 Bedroom Terraced House For Sale in Penzance for £333,000. OPEN HOUSE EVENT SPECIAL PRICE 27th-28th April. REDUCED from 340,000 for the EVENT DATES ONLY. Please call for details and VIEWINGSA most charming and deceptively spacious three double bedroom character home that is nestled within this idyllic square. 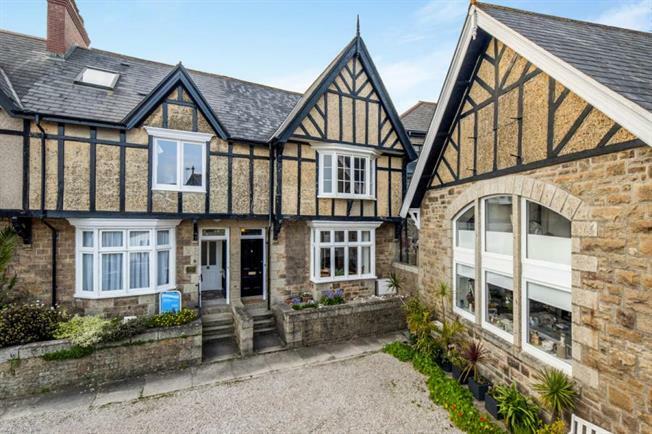 The property itself has undergone a schedule of sympathetic modernisation by the current Vendors yet retains the character and period features one would expect to find within. The home is warmed via a gas central heating system with accommodation in brief comprising a light and airy lounge, dining room, kitchen, utility room and shower room to the ground floor with the three double bedrooms and bathroom to the first floor. It should be noted that lovely coastal views to Mounts Bay can be enjoyed from the master bedroom. Outside to the rear one will find a secure, gated courtyard with brick built storage sheds of which one also incorporates a WC. Wooden obscure glazed sash window to rear. Shower cubicle with tiled surrounds and electric shower. Low level WC. Vanity mounted wash hand basin. Storage cupboard which further houses the gas combination boiler. Radiator. Wooden part obscure glazed door to the side in turn leading to the courtyard. Wooden sash window to side. A lovely bespoke hand crafted kitchen with wooden worksurfaces incorporating recessed marble trivets, inset stainless steel sink and drainer and a gas hob with canopy extractor over. Cupboards and drawers beneath along with integral dishwasher, fridge and freezer. Tiled surrounds with cupboards above and plate rack. Integrated oven and microwave. Tiled flooring. Radiator. Wooden sash window to rear. Stripwood flooring. Radiator. Wooden sash window to side. Strip wood flooring. Radiator. Skylight roof window. Pannelled bath with tiled surrounds. Close coupled WC. Pedestal wash hand basin. Wall mounted heated towel rail. Double shower cubicle with mains fed shower over. Airing cupboard. Strip wood flooring. FRONT - Token front garden with steps rising to the front of the property. REAR - A good size courtyard with rear pedestrian gated access off a secure gated lane. Brick built storage sheds of which one incorporates a low level WC. Outside tap. The current Vendors park two vehicles in tandum outside the front of their property which is on sizeable shared driveway for the past 17 years.